Christmas is my favorite holiday! I love the music, the lights, the decorations, the traditions, the food, the drinks and more importantly spending time with my friends and family. For most of us, this easily translates into hectic schedule that involves overeating and imbibing. According to studies, most Americans gain 1-2# over the holiday season. So, how can we avoid this or, at best, minimize this weight gain and total derailment from our healthy ways? First, during the holidays, keep your health and exercise routines a priority. 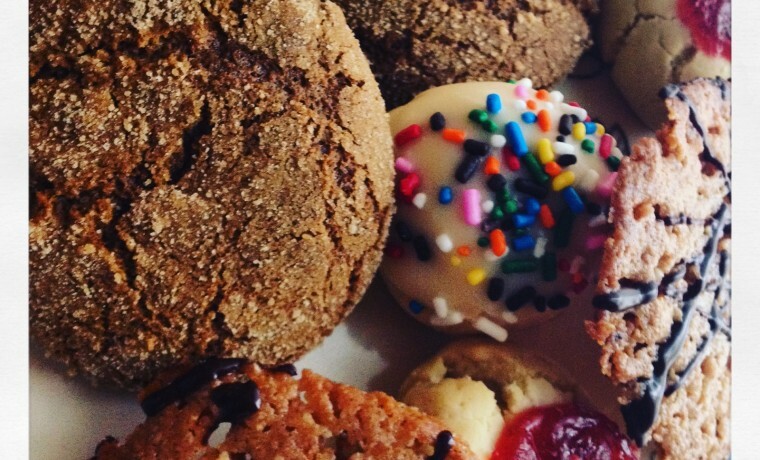 If you have worked hard to lose weight, you don’t want to sabotage your success with pounds of cookies. (That’s my downfall… anisette cookies… for breakfast, for lunch or for snacks! SO GOOD!). I think it is important to have realistic goals during this time. Your goal may need to be altered slightly to weight maintenance, as losing it during the holidays may not be sensible. So… how are we to get through this calorically challenging time of the year? Like I said, make your health and exercise a priority. Make sure to schedule your exercise time. I find it better to do it in the morning before the shopping, present wrapping, cooking, baking and egg nog drinking. Get it done first thing in the morning! Here’s some food for thought- Holiday events and gatherings do not have to revolve around food! This may be pushing it a little, but it’s true. Instead of binging on pepperoni and cheese and fruit cake, how about play some games or build a gingerbread house with your family? It’s a special time of year! Remember to enjoy it!